Juan González uses New York City’s politics to illustrate how municipal governments can take steps to make urban living more affordable for working families. He will speak in Seattle on Oct. 27. 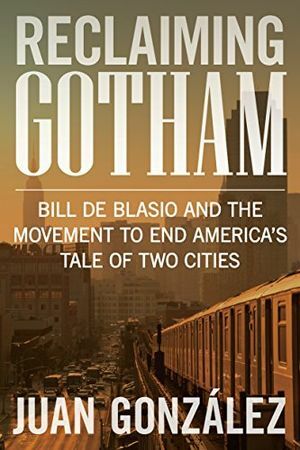 The core premise of Juan González’s book “Reclaiming Gotham: Bill de Blasio and the Movement to End America’s Tale of Two Cities” is that the nation’s wealth and income gap have resulted in too many city dwellers struggling to pay rent and other necessary expenses. He argues that municipal governments can take dramatic steps to make urban living more affordable for working families. González uses New York City’s politics to illustrate how that can happen. Under Mayor Michael Bloomberg, New York saw the economy boom, with developers replacing huge, rundown inner-city neighborhoods with much higher costing housing for the influx of largely younger, wealthier and whiter residents. At the same time, there were further reductions in public spending on social services. The result was that many business owners prospered and the richest residents ended up getting even richer. From 2002 to 2012, the top 1 percent of residents went from taking in 27 percent of all income to 45 percent. Meanwhile, 21 percent of the city’s households earned less than the federal poverty level, and a third of renters were paying more than half of their income for housing. In 2013, mayoral candidate Bill de Blasio, a former City Council member, won election, along with a slate of very progressive new city public officials. Sharing a philosophy that New York was dangerously out of balance in the distribution of incomes and wealth, they set about reversing that course. González describes in fascinating detail not only how de Blasio beat the odds to win, but how he began to reshuffle the city’s priorities. His collection of programs provided universal prekindergarten to 70,000 children, paid sick leave for all employees, froze rent increases for tenants in rent-regulated private buildings, and initiated services or programs that saved residents from spending an estimated $21 billion. Such efforts were not unique to New York. González describes candidates elected in cities like Pittsburgh; Austin, Texas; Seattle; Minneapolis; Philadelphia; San Francisco; and Richmond, California, who ran on platforms that rejected the dominant neoliberalism philosophy that “the private sector did things faster, better, and cheaper than public employees.” Raising the minimum wage and requiring paid sick leave for all employees often followed their elections. Many of these leaders were members of a national network of progressive municipal officials called Local Progress that shared information on legislation being introduced and passed in their respective cities. However, “Reclaiming Gotham” is not blind to the opposition that such policies generate or to the shortcomings of the advocates themselves. Within New York, de Blasio faced a massive slowdown of police enforcement when department members accused him of creating an anti-police climate. More seriously, financial and real estate interests “spent nearly $20 million on media ads targeting the mayor between 2014 and 2016,” hoping to confine him to one term. Meanwhile, state and federal prosecutors investigated his administration for illegal influence peddling. They ultimately found “no evidence of personal profit” by the mayor or his staff, and no criminal charges were filed. While his image took a hit, de Blasio won the Democratic primary easily and is expected to have another term. Other progressive politicians faced their own resistance from well-financed campaign opponents or saw their bases splintered on some issues. González notes that because 80 percent of the country’s 75 largest cities have Democratic mayors, many promoting liberal programs, they can provide a bulwark for resisting President Donald Trump’s reactionary policies. By pushing the twin goals of equity in city services and effective municipal governance, politicians can alter the “Tale of Two Cities” from one where cities are divided rich and poor, white and nonwhite, to one of greater community. Nick Licata is a former Seattle City Council member and author of “Becoming a Citizen Activist.” You can contact him at becomingacitizenactivist.org.